The world would not be the world we know today without explorers. 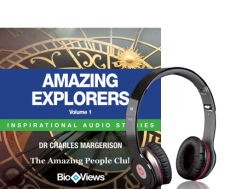 This inspirational audio story collection from the Amazing People Club brings the lives of four amazing explorers to life through BioViews. A BioView® is a short biographical story, similar to an interview. These unique stories provide an easy way of learning about amazing people who made major contributions to our world. Journey with captain James Cook from his birthplace in Yorkshire to the frontiers of his explorations to the vast Pacific Ocean and beyond. Gain a new insight into the real life of Christopher Columbus whose explorations are still felt today. The lesser-known Yuri Gagarin is often referred to as 'The Columbus of The Cosmos'. The territories he explored were of course very different to those of Columbus but are no less amazing.